THREE-VIEWS: Three New Titles Worth Checking Out! Midtownies! Raph is back, here with three more recent releases you should check out, and to be fair, they are three books from three different comics. Furious is a new serious (Issue #2 was released on Feb. 26th, 2014), from Bryan JL Glass (Mice Templar) that deals with a lot of themes of our pop culture, such as celebrities and their downward spirals. Furious is a new superheroine, and a violent one at that, but she has her heart in the right place. In a world where superheroes don’t exist, the spotlight is white hot on her, and what that spotlight does to a person. We also hear in snippets about the fall of a child star named Cadence Lark, which involved debauchery, an accident and the death of her parents, and (spoiler) how Cadence and Furious are actually one and the same. A thought provoking commentary on celebrity culture wrapped in a superhero shell. Bryan Glass’ dialogue for Cadence is a bit brusque, but that fits the attitude of our socialite turned would-be hero: she’s not the greatest person in the world, but she’s trying to do some good despite the darkness in her past. Victor Santos’ art is terrific as well, I’m hooked in for this downward spiral that is the life of Furious, and you can expect that her fall will fit her nom de guerre. This book had a controversial beginning, with a poorly timed contest that had artists drawing an image in poor taste, but the quality of the book shines despite that ugly beginning. Harleen Quinzel, former doctor at Arkham Asylum turned psychopath, has be bequeathed a building in Coney Island, replete with tenants from the local freakshow, and tons of space for her extracurricular activities. Harley’s early adventures mostly consist of fairly innocuous things: rescuing animals from being put down, finding a refrigerator to put dead corpses, all with her trusty partner: a stuffed, talking beaver. The humor is a bit reminiscent of early Looney Tunes (the crass stuff that they don’t put on TV because Bugs and co. are for kids now), or even a certain Mouthy Mercenary… but Harley has always been an offbeat, out there character. Jimmy Palmiotti is a known quantity when it comes to writing. I’m not sure how much I’ve read of Amanda Palmer’s work, but I know that she has drawn some of the best cheesecake in comics, and that includes pieces with Harley. She seems to have a decent grasp of the character, the four issues (zero issue included) were written fairly well and they felt natural to our favorite nutjob. Chad Hardin’s art is pretty evocative of artists like Stephane Roux and Todd Nauck, two artists whom I enjoy greatly. If you were turned off by the whole controversy last year, check the book out, it’s an enjoyable, fun book. 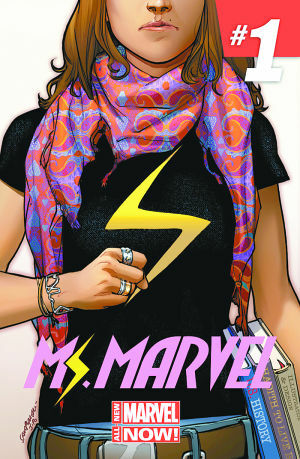 Another book that got a lot of media attention, Ms. Marvel features the first Muslim-American character in a lead role. What is she like? How is she different from everyone? How much do they emphasize her “Muslim-ness”? 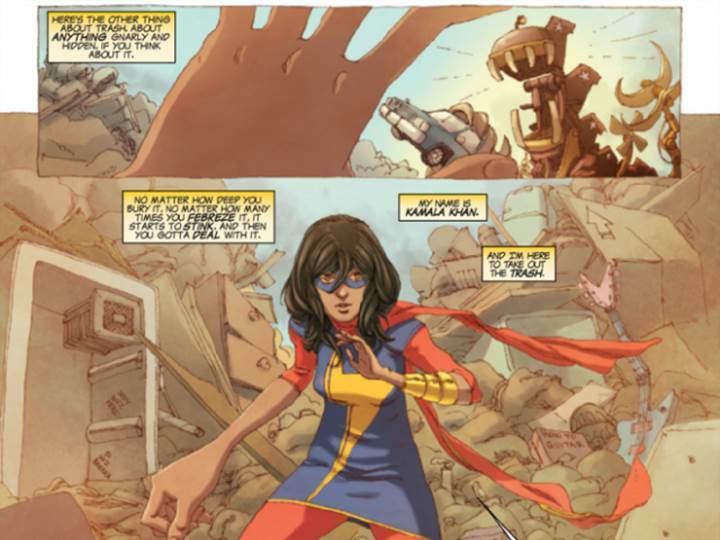 Just what is Kamala Khan? Well it’s really quite simple: she’s a normal person. More specifically, Kamala Khan is a teenage girl obsessed with superheroes. Wouldn’t you be, living in an Avengers world? Kamala’s family is from Pakistan, and she is a second generation American (first to be born here). Her culture comes up almost immediately as she faces discrimination from the popular kids in school, to having a more religious older brother, to the conservative parents. But is that inherently a Muslim experience, or is that more of a universal immigrant experience? I’m also a second generation American, and I could identify with a lot of what G Willow Wilson put into this first issue. Speaking of G. Willow Wilson, she wrote the fantastic series Air, which I’ve read, and Cairo (which I have not). Her writing is a draw for me, and this series is no exception. Kamala has a distinctive voice, and her struggle to fit into two worlds (and now a third: the superhero world) is very poignant and feels real. The additional twist of how Kamala gets her powers (spoiler) via the Terrigen Bomb Black Bolt unleashed in the page of Infinity (end spoiler) also adds another wrinkle to this complex character we’ve only barely gotten to know. Add on top of this the art of Adrian Alphona, co-creator of the Runaways, and you have a dynamic team and a beautiful book. Mr. Alphona’s art has been a favorite of mine since his days on Runaways, and I haven’t seen it often, but I’m glad to see it on a book of this quality. This book is one of the better All-New Marvel Now launches, worth a look beyond the original hype. So that’s my perspective, definitely give these books a look at, and feel free to comment below, and get a dialogue going. If there’s anything you’d like to put out there for others to check out, feel free to mention it the comments too. Thanks for reading!